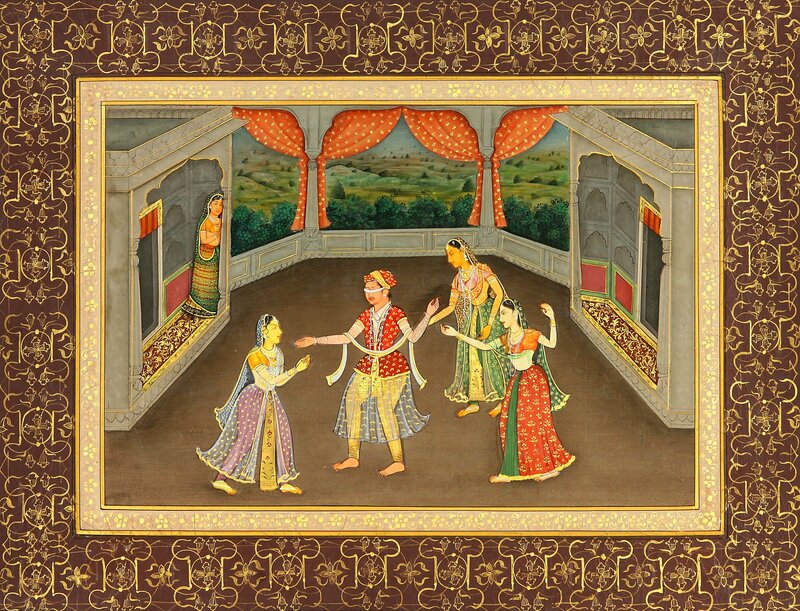 A contemporary miniature, though in late 18th century idiom of Mughal art-style practiced at Subai headquarters like Oudh, the painting represents a prince with a band of cloth tied on his eyes sporting with three of his harem inmates, the maids. Away from the sporting ring there stands in one of the cabins a non-participating female, perhaps one of the royal ladies, watching the sporting prince with some kind of disapproval on her face. Leaning in pensive mood against the door-frame the lady seems to be unhappy with the prince and does not approve his flirting with the low breed maids. As regards the participating maids the figures are finely executed – well proportionate anatomy, glowing complexion and charming faces, but lack in life and vigour and the gestures are just formal and calculated as if their participation is just a part of their duty. The scene is laid over a terrace, perhaps open or half covered with a roof, though a high peripheral wall and beautiful cabins on the right and the left separate it from the rest. The back of the terrace consists of three sides of a hexagon, each defined by a shallow-arched opening with beautiful curtains collected along the door-frame. The terrace overlooks a wide spread green patch of land, level as also covered with low height mounds, trees of various kinds, shrubs and meadows scattered all over. The game that the sporting team is engaged in requires at least three or more participants, one with a band of cloth on eyes being the finder, that is, one who with his eyes closed finds from the rest his replacement, and others to remain around but away from the finder for whoever the finder touches shall replace him or her. The game is colloquially known as ‘ankha-michauchi’ – one played with closed eyes, or one of its types. It is a children’s game and hence the displeasure of the royal lady in the cabin for she feels that the prince, besides behaving child-like, is using it for flirting with harem inmates. As is the game’s tradition, the game is initiated by fixing a finder from amongst the participants with the help of a puzzle or by using some other method. His or her eyes are closed with a band of cloth and then he is let to move around and get hold of any of the other participants moving around in the ring. The participants, other than the finder who has his eyes closed with the band of cloth and has to find his replacement from others, shall keep making some kind of sound and the finder with band on eyes shall locate his or her prey from the sound that such participant makes. Whoever the finder gets hold of shall replace him or her and this shall continue till the game lasts. Though a recent work, the painting pursues verbatim the idiom of Mughal art as it prevailed around 1950 and after especially under Subai heads who, after Mughal Empire had waned, had proclaimed independence and were sovereign states. Deeply influenced by Mughals, their ways, things they excelled in and overall lifestyle they strove to copy everything that they loved and promoted. Obviously, painting was on the top of the list. However, they had neither the Mughal court like gifted painters who were imaginative and self inspired nor these new patrons had such insight as could inspire and infuse into them such imaginative fervour as could transform them into talented painters. The worst was the lack of serious art themes and a broad vision to represent them. As a result the Subai courts had art activities but the paintings that they rendered were neither spiritually sound, represented serious themes nor were imaginative and were able to inspire. As in real life these new patrons of art were busy in trifles, merriment and pastimes, the art that they promoted sought to represent wherein reflected its masters’ taste. This description by Prof. P.C. Jain and Dr. Daljeet.